SAN IGNACIO, Belize - Dec. 13, 2018 - PRLog -- Launched to rave reviews and already a bestseller, The Ultimate Belize Bucket List is available from FriesenPress, Amazon, Barnes and Noble, and all other major booksellers. 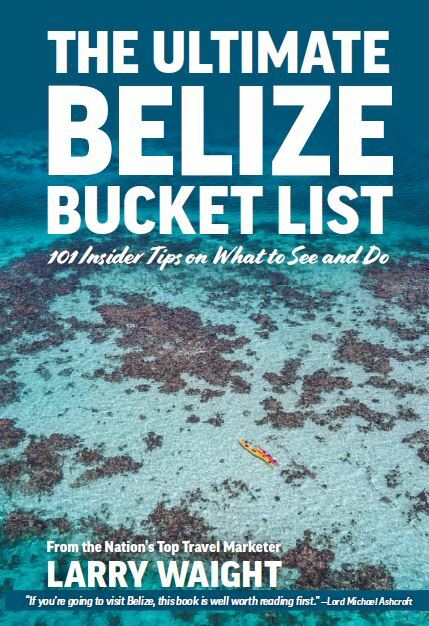 Written by Larry Waight, a true insider who was born in Belize and has spent more than 20 years working in the tourism industry, The Ultimate Belize Bucket List is designed to be a comprehensive "travel bible" for anyone visiting the country. And true to his generous spirit, Waight will be donating a portion of the proceeds from the book to the Belize Tourism Industry Association (BTIA) which works tirelessly to promote sustainable tourism and protecting the environment. Proceeds of the book will also be used to sponsor local disadvantaged youths with educational scholarships. Advance copies were shared with some of the luminaries in the Belize travel world, and The Ultimate Belize Bucket List has earned glowing reviews. "This book really gives you a granular view of our amazing country which has one of the most unique natural landscapes on the planet. Combining travel tips with history, geology, and biology, this comprehensive book should be required reading for anyone even thinking of visiting Belize. And the fact that a part of the proceeds are going to help conserve and protect Belize's natural wonders is just the cherry on top. Dive into this amazing book and come visit Belize!" said Bernard Wagner, mayor of Belize City. "A truly great guide to Belize, including chapters on the rich cultural diversity that makes our country such a wonderful place and lush, vivid descriptions of our many World Heritage Sites," said Said Musa, former Prime Minister of Belize. "The definitive guide to our jewel of a country, otherwise known as Mother Nature's best-kept secret. This superb book was clearly written with a genuine love for Belize," said Andy Wigmore, a former Belizean ambassador. "Sorry to say this, but all of the guidebooks written before The Ultimate Belize Bucket List were written by well-meaning but clearly confused foreigners who haven't quite grasped the subtle complexities of Belize. It's high time that we had a book like this that truly honors this amazing country," said Rodwell Ferguson Jr., director of Untame Belize. "I too grew up in Belize, but even I learned a few new things in The Ultimate Belize Bucket List. This book was a true delight to read, and I have been enthusiastically telling everyone I know to buy a copy," said Megs Yearwood, owner of Barefoot Rentals and Services. Unlike other guidebooks written by big-name authors who visit Belize once every few years, The Ultimate Belize Bucket List was written by a true insider who has spent the last 20 years dedicating his life to promoting and celebrating his native country. The Ultimate Belize Bucket List is designed to include absolutely everything that a traveler might need to know to make the most of their time in Belize. If you or anyone you know is considering visiting Belize, be sure to buy your copy of the The Ultimate Belize Bucket List today.